There are so many fun quilt alongs, mysteries, and block parties going on right now, it's hard not to be tempted to join in with all of them! (Not to mention starting my own Block of the Month this week) I guess it's part of the fun of quilting - after all there's not many things as fun as starting a new project. The pink is my accent. I'm looking forward to seeing what we'll be making - it's bound to be pretty with these lovely fabrics! 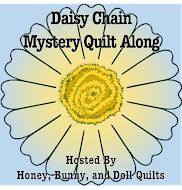 You aren't too late to join up, too - just go to Little Bunny Quilts and start pulling your fabric - cutting instructions will be coming out next week! Darn you, lol! I've joined in too :-) Oh well, what's a quilters life without a lot of projects in the work at once?